All the carpet tiles are installed and the space is ready for furniture! 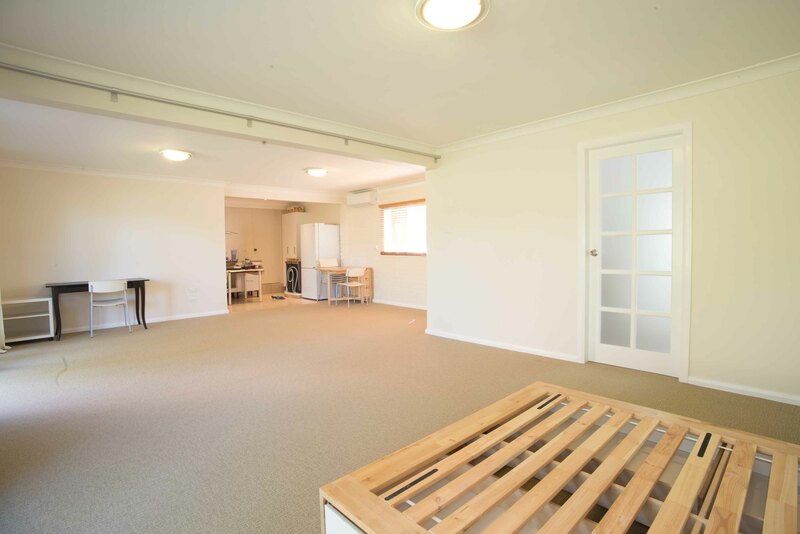 After having spent a lifetime in houses with predominantly wooden or tiled floors, Andrew was keen to have carpet laid across the majority of the concrete floor of the apartment. The garage space needed the extra warmth that comes with softer textiles, and both Andrew and Emma appreciated walking around their space with carpet under bare feet. 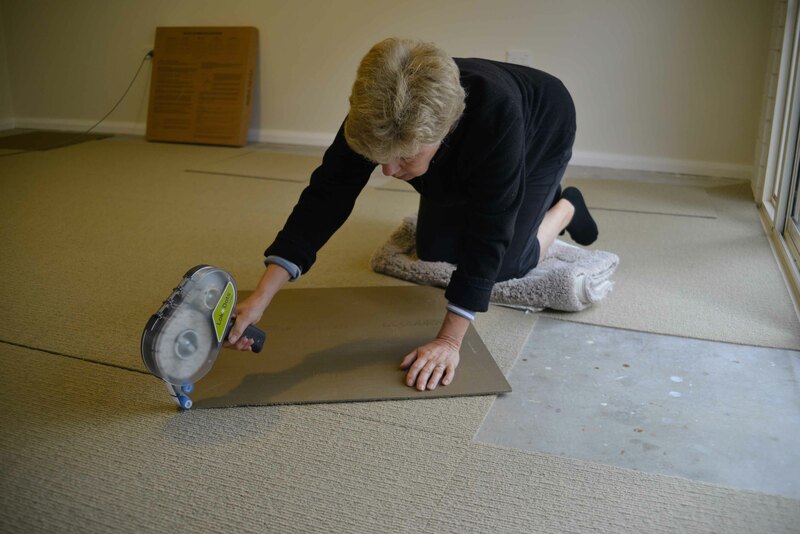 As with paints and a plethora of other interior design and construction materials, VOCs can be a problem in carpeting. Substances hazardous to both human health and the environment are also a concern when it comes to the manufacturing process. 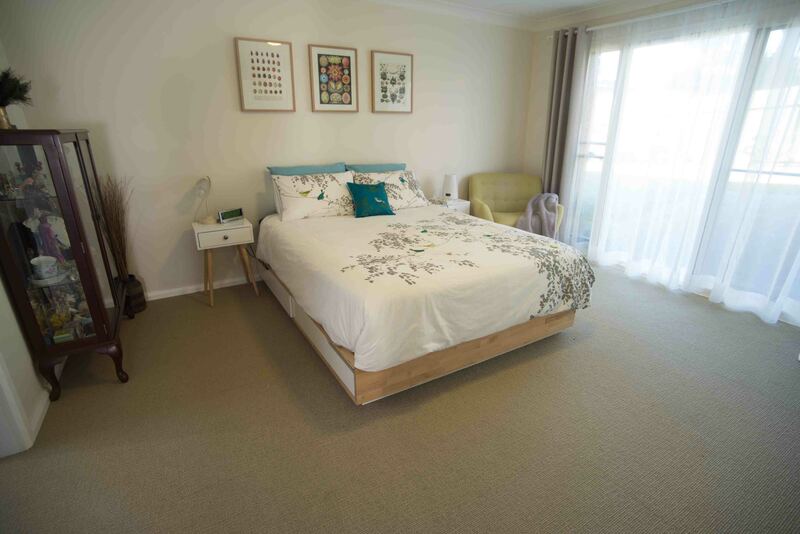 GECA certified Shaw Contract Group were able to provide low-VOC carpet tiles for use throughout the apartment. The team at Shaw were incredibly easy to deal with,” said Emma. “They answered all our questions, helped us with choosing the right product and handled everything from selection to delivery really smoothly. Shaw supplied Applied EcoWorx Modular Tile Carpet in ‘Ionized’, a warm light brown that complemented the neutral palette of the apartment. They also supplied LokDots, an adhesive system designed specifically for use with the carpet tiles and which was suitable for applying on a range of surfaces, including concrete. The tiles were easy to install, with detailed instructions provided on the box. Tiles were laid carefully in the same direction as indicated by arrows printed on the underside of the tiles. Cutting tiles to size was a simple case of careful measurement and deft use of a sharp Stanley knife. The LokDots were then applied to the underside of the carpet tiles using the purpose-built LokDots applicator, and the carpet was fixed into place. Although Shaw usually supplies carpets for commercial and industrial applications, as opposed to residential, the tiles worked well in the couple’s flat. They proved to be very easy to clean and resistant to wear and tear. The tiled format also came in very handy when the couple discovered a leak around the floor-to-ceiling sliding doors at the entrance to the apartment. The property we’re on has a fairly steep slope to it and tends to funnel water towards our doors. There’s a drain that runs along just outside the doors, but if there’s a massive downpour, it can have trouble coping. We then found that water was coming into our flat underneath the sliding doors, seeping up through the concrete, thanks to faulty waterproofing work. The tiles along the door got a bit wet because of that, but we were able to take them up really easily, dry them out, fix the waterproofing problem, and then stick the tiles back into place. They weren’t damaged at all. If the tiles did sustain any damage from non-toxic sources, Shaw’s environmental take back guarantee means the discarded EcoWorx tiles would be collected, transported and recycled. That means less in landfill as the tiles become raw materials for producing new carpeting and for use in other industries. Find out more from Shaw Contract Group. Click here for part 6 – furniture.